Standing tall at the heart of a mountain, a once strategic fort offering protection to people for centuries seems to be losing its battle against nature. 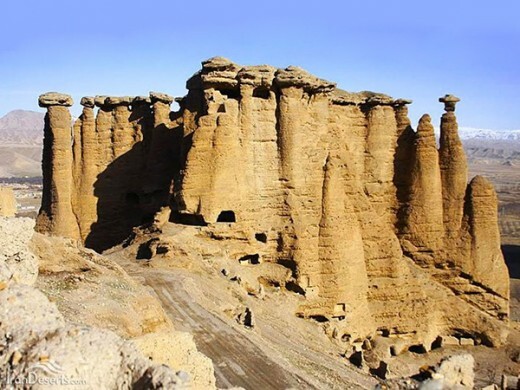 Behestan Castle is a historical castle in Mahneshan, a town in northwestern province of Zanjan. The fort, designed to defend those in power as well as ordinary people against probable attacks, was built during the Achaemenid Empire [First Persian Empire]. The upper levels of the castle were for defensive purposes, whereas the lower parts were used as a storage depot. Standing at the heart of a mountain made of heavily compacted soil consisting of conglomerate rocks, this ancient structure has been exposed to erosion thanks to strong winds and a river flowing nearby. Archeological research suggests that the castle has been in use five centuries after the dawn of the Islamic era.